Buenos Aires’ La Nación newspaper has a thorough feature story on the Tarjeta de Abastecimiento Seguro, the government’s new fingerprint-activated card to control how much you can buy at government stores. For example, did you know the CNE is behind the whole operation? And that when you register for the card, they ask for a whole bunch of personal information? Hmm, I wonder what those two things have in common? What could the CNE possibly want with your purchase, employment, and contact information…? According to official figures, starting April 1st more than 300,000 people have registered in the system, which is run by the National Elections Council (CNE), who has the information on Venezuelans’ fingerprints. 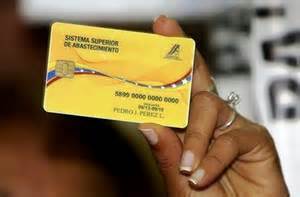 With their ID cards, and by providing the fingerprints for their index fingers and thumbs, any Venezuelan can register in the system. In other words, the electoral council knows what you eat, where you shop, how the government helps you … and it also lets you vote. Next articleIs Venezuela a middle class country?